This recipe for Triple Chocolate Amish Friendship Bread was submitted by Kitchen Friend May Naing and is a surefire favorite for chocolate lovers everywhere! This recipe for Triple Chocolate Amish Friendship Bread is a surefire favorite for chocolate lovers everywhere! Dust the greased pans with sugar. Pour the batter evenly into loaf pans and sprinkle with sugar on top. Bake for 60-75 minutes or until the bread loosens evenly from the sides and a toothpick inserted in the center comes out clean. Oh wow, that looks delicious!! I love Amish bread. They used to have a stand at our local flea market, but they left about a year ago. I miss their cookies and breads! I’m a horrible cook, but I’m going to try this anyway! I’m stopping by from the Alexa hop, by the way! Following you on Facebook now. I’m dropping by with my sparkly little Alexa toolbar. I’d love it if you’d drop by A Helicopter Mom with yours! i may only be in 9th grade but i know a good friendship bread when i see one… the reason i’m even looking for a friendship bread is because i’m taking a class at wayne high and needed to find a great bread to impress my teacher. hopefully this bread will get me a good grade!!!! This is our favorite. I bake it in a Bundt pan. It’s so decadent and chocolaty. I use dark chocolate chips and Hershey’s dark chocolate cocoa powder, and Hershey’s special dark chocolate pudding. This is to die for DELICIOUS!!!!!! This is my fave Amish bread recipe. So moist and chocolatey it almost feels sinful. I made this recipe yesterday. I made one batch following the recipe exactly and it was delicious. For the remaining batches I tweaked it and doubled the Coco’ (4 heaping teaspoons) and added cocoa to the sugar in the pan. I used a large box of chocolate fudge pudding. What I ended up with was basically loaf form brownies. Absolutely fantastic! I’ve tried several of your recipes using the friendship starter. 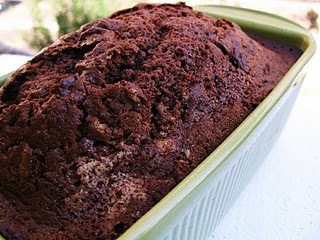 Everyone loved them—I tried the pumpkin cranberry oil-free and just finished the chocolate zucchini bread. Added semi-sweet mini chips, probably should have added cocoa powder. I was wondering if you could use sugar blend for the starter to cut down on the sugar. With the starter and making bread, you go through 4 cups of sugar. I made the chocolate with sugar-free instant pudding using chocolate fudge and it turned out great. You could reduce or swap the sugar in the recipe, and you can reduce the sugar in the starter, but do not use sugar alternatives in the starter — they won’t interact properly with the yeast. Hope this helps, and so glad you enjoyed the recipes, Shirley!